An homage to Todd Rundgren: Thanks for more than 4 decades of music TR. First things first - I have been a fan of Todd Rundgren for at least 40 years. I am not very good at stats and remembering dates, but I have seen him in concert many, many times - I know there was one year when I caught Todd/Utopia seven times in and around Michigan. 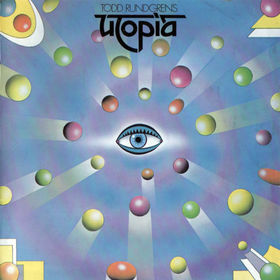 Sure, I listened to his radio stuff - "We Gotta Get You a Woman", "Open My Eyes", and "Hello, It's Me" but Todd really grabbed ahold of me with the Utopia album. I have always enjoyed Prog-Rock most when it presents long songs that introduce a musical theme, riff on it, and return to it. "The Ikon" is over 30 minutes long and used up one side of the vinyl. Never tire of this song - was lucky enough to hear Todd perform it (again) and this whole album a couple years ago in Akron. Blew me away.